Big Lebowski Screening and New Years Movie Marathon! C. Thomas Howell: Hey, don't you know who I am? I'm C. Thomas Howell! I was the black dude in "Soul Man"! Basically a high budget home movie of the Chong family. 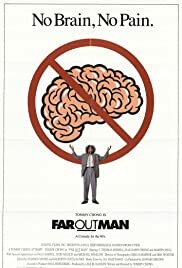 If you are a big fan of the Cheech and Chong films,you might want to give Far out Man a try, but unless youre really starved for Tommy Chong and his Hippie comedy, I say to stay Far Out of this movie's way. The plot is rather thin, the humor is far-placed and unfunny, and overall I'd say that this film is quite boring. You'll get to see Chong's son and daughter, along with his wife--all of whom can't act in the slightest, and take up large portions of the movie. It's basically a home video, which he probably put together just to have a good time with the family. I'm sure it was great fun for them, but for us it's only a lame film.